IDJ and Hugh Farmer have been trying to find out about a power company that is supposed to have existed in Tai O on Lantau Island. 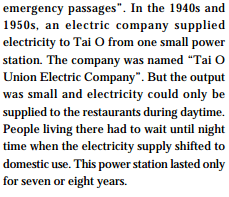 China Light and Power’s website says that in 1955 the company acquired the Tai O Power Company “which supplies power to Lantau Island”. So we have a new name, Tai O Union Electric Company. More information, location, dates and images of the plant would be great. 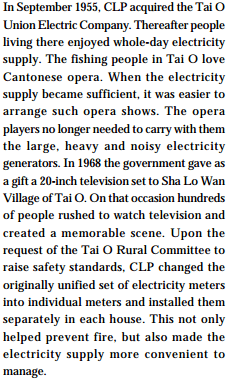 See: CLP’s website about the history of supplying electricity to Tai O and Lantau generally, and other islands. This article was first posted on 22nd August 2014. Q+A4 Tai O Land More valuable than in Central? 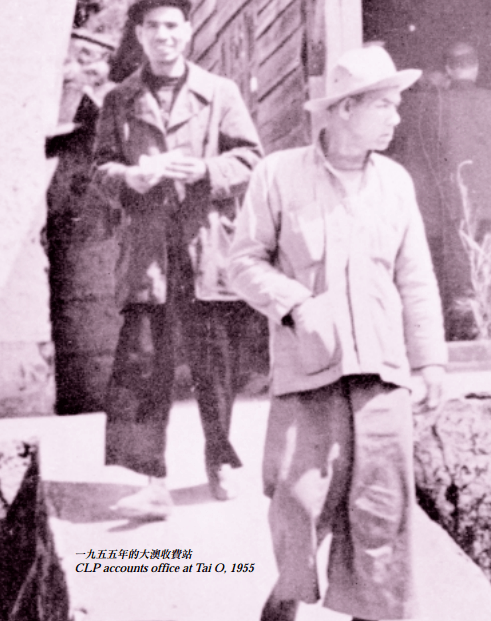 From the Chinese-language version of the same document, the Chinese name was “大澳合眾電力公司”. Googling that brings up 513 hits, but most of them seem to simply be repetitions of the same info we already know — when CLP took them over. This url (http://www.hk-place.com/viewtext.php?id=259) has slightly more info, and says (via Google translation): “Peninsula Power Generation Company was founded in 1964, CLP and American Standard Oil (Esso or that late now ExxonMobil) funded Hok power plants are responsible for the expansion of power plants and the construction of Tsing Yi. Kowloon generation company founded in 1978, is also funded by the CLP and Esso, are responsible for the construction of power plants and the expansion of Hok Castle Peak Power Station A plant. Castle Peak Power Company was founded in 1981, is funded by the CLP and Esso, namely the construction of the Castle Peak Power Station B plants, power plants and Penny’s Bay BPPS.